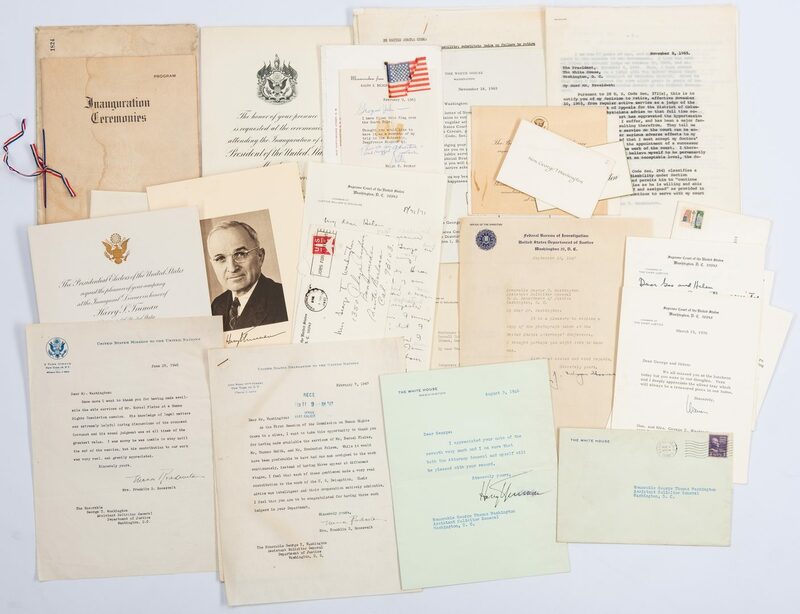 Judge George T. Washington archive of political letters and ephemera, 27 items total, including letters from Truman, Eleanor Roosevelt, Warren Burger, and more. George Thomas Washington (1908-1971) was an American jurist who served as judge of the U.S. Court of Appeals for the D.C. Circuit from 1949 to 1965. 1st item: TLS. One page typed bifolium. 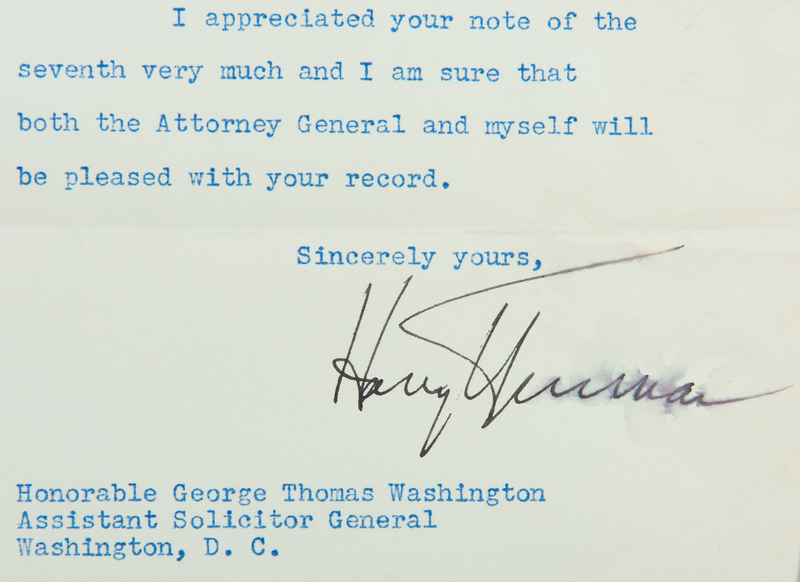 From President Harry S. Truman, The White House, Washington, D.C., to The Honorable George T. Washington, Assistant Solicitor General, Department of Justice, Washington, D.C., dated August 9, 1946. The letter reads "Dear George: I appreciated your note of the seventh very much and I am sure that both the Attorney General and myself will be pleased with your record. Sincerely your, Harry Truman". 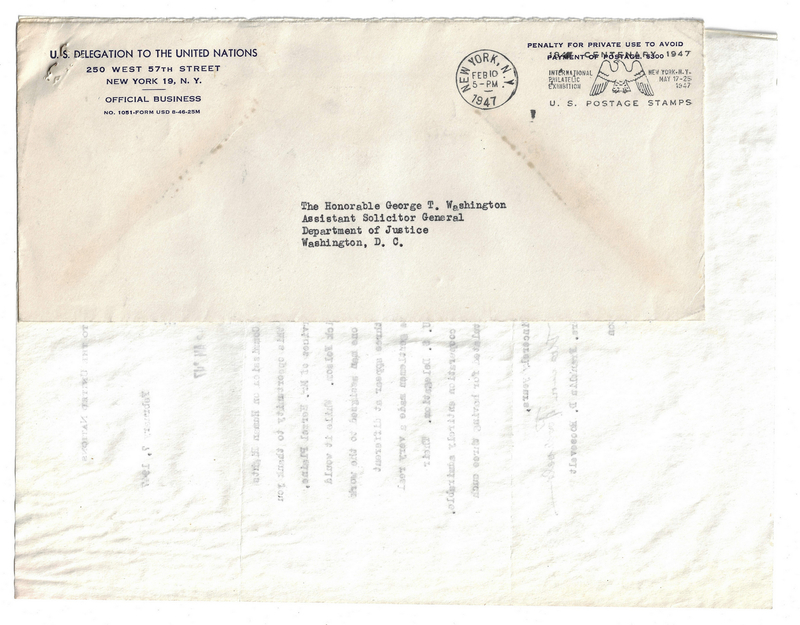 Includes The White House envelope with purple three cent Washington stamp, postmarked August 9, 1946, Washington, D.C. Letter – 9" H x 7 1/8" W. Envelope – 4 7/8" H x 7 3/8" W. 2nd item: TLS. One page typed letter. 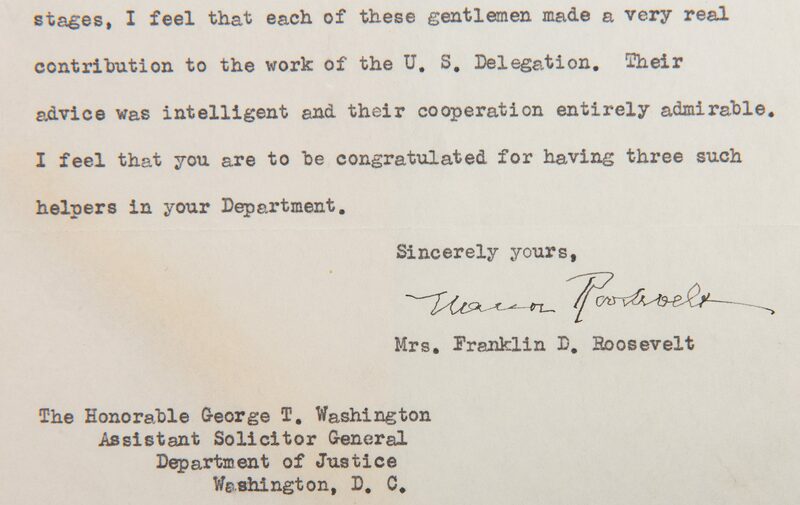 From Eleanor Roosevelt, United States Delegation to the United States, New York, NY, to The Honorable George T. Washington, Assistant Solicitor General, Department of Justice, Washington, D.C., dated February 7, 1947. She writes "Dear Mr. Washington: As the First Session of the Commission on Human Rights draws to a close, I want to take this opportunity to thank you for having made available the services of Mr. Herzel Plaine, Mr. Turner Smith, and Mr. Frederick Folsom. White it would have been preferable to have had one man assigned to the work continuously, instead of having three appear at different stages, I feel that each of these gentlemen made a very real contribution to the work of the U. S. Delegation. Their advice was intelligent and their cooperation entirely admirable. I feel that you are to be congratulated for having three such helpers in your Department. Sincerely yours, Eleanor Roosevelt Mrs. Franklin D. Roosevelt". Includes United States Delegation to the United States envelope, postmarked February 10, 1947, New York, N.Y., stapled top left of letter. Letter – 10 5/8" H x 8 1/8" W. Envelope – 4 1/4" H x 9 5/8" W. 3rd item: TLS. One page typed letter. From Eleanor Roosevelt, United States Mission to the United States, New York, NY, to The Honorable George T. Washington, Assistant Solicitor General, Department of Justice, Washington, D.C., dated June 28, 1948. 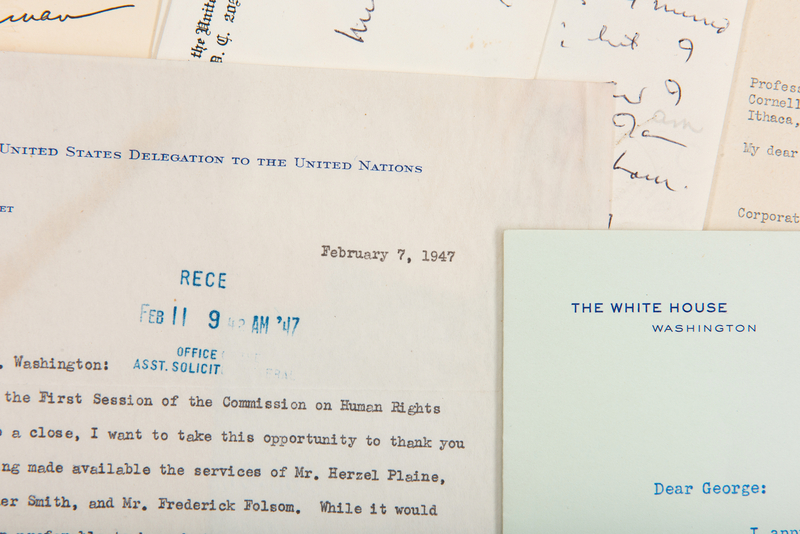 She writes "Dear Mr. Washington: Once more I want to thank you for having made available the able services of Mr. Herzel Plaine at a Human Right Commission session. His knowledge of legal matters was extremely helpful during discussions of the proposed Covenant and his sound judgment was at all times of the greatest value. I was sorry he was unable to stay until the end of the session, but his contribution to our work was very really, and greatly appreciated. Sincerely yours, Eleanor Roosevelt Mrs. Franklin D. Roosevelt". 10 5/8" H x 8 1/8" W. Note: Herzel H. E. Plaine (1908-1996) From 1946 to 1952, he served as legal adviser to former first lady Eleanor Roosevelt, who was a U.N. delegate. He also as a legal adviser or delegate to U.N. bodies dealing with human rights, freedom of information and environmental and social issues. 4th item: TLS. One page typed bifolium. From Warren E. Burger, Chambers of the Chief Justice, Supreme Court of the United States, Washington, D.C., to Honorable and Mrs. George T. Washington, Santa Barbara, CA, dated March 19, 1970. Burger writes to express his regret that the Washingtons were not able to attend a luncheon. 7 7/8" H x 5 7/8" W. 5th item: ALS. Double-sided handwritten card stock note card. 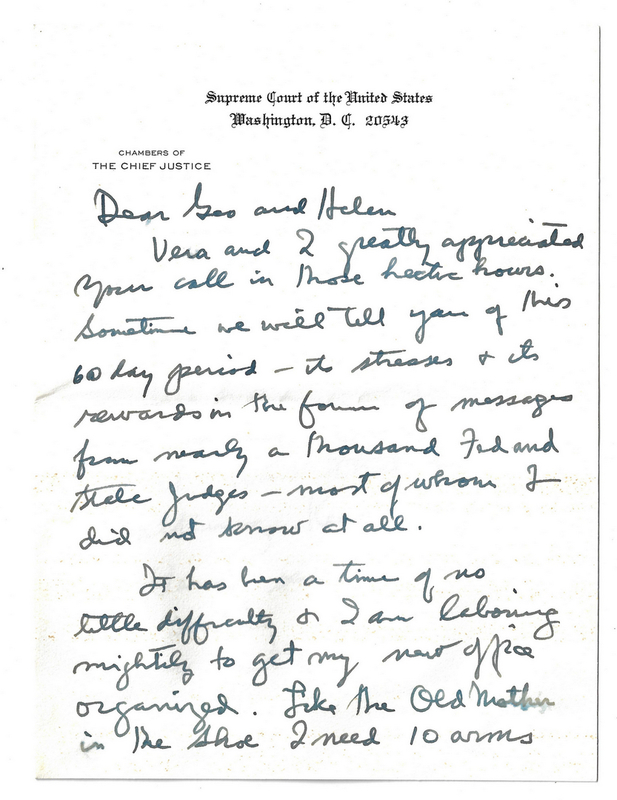 From Warren E. Burger, Chambers of the Chief Justice, Supreme Court of the United States, Washington, D.C., to Honorable and Mrs. George T. Washington, circa 1970. Burger write about the Washingtons' request for a portrait of him and to express his hope that George's health will improve. Includes Chambers of the Chief Justice, Supreme Court of the United States envelope. Note card – 3 1/2" H x 4 5/8" W. Envelope – 3 5/8" H x 5" W. 6th item: TLS. One page typed bifolium. From Warren E. Burger, Chambers of the Chief Justice, Supreme Court of the United States, Washington, D.C., to Mrs. George T. Washington, Santa Barbara, CA, dated August 26, 1971. Burger writes to offer his condolences upon learning of George T. Washington's death. 7 7/8" H x 5 7/8" W. 7th item: ALS. Two page handwritten bifolium. 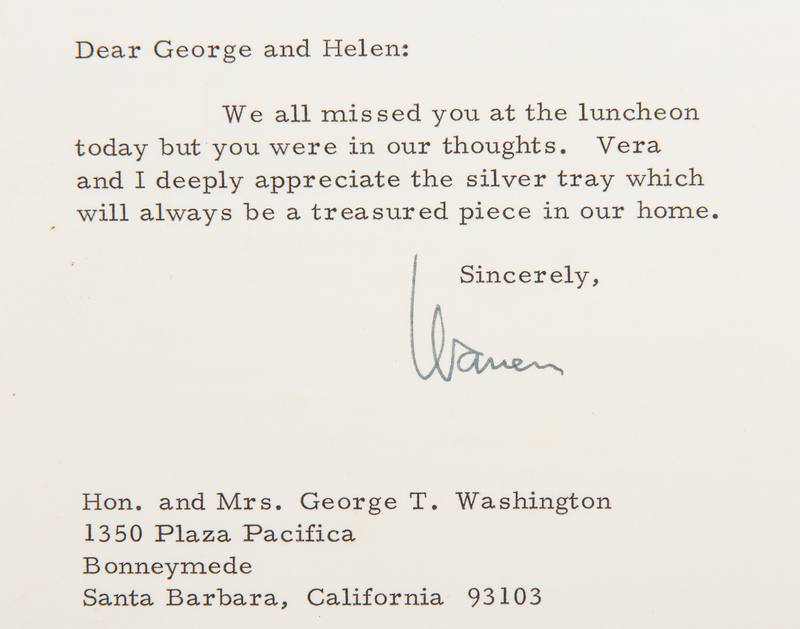 From Warren E. Burger, Chambers of the Chief Justice, Supreme Court of the United States, Washington, D.C., to Mrs. George T. Washington, Santa Barbara, CA, dated circa August 5, 1969. Burger writes to inquire after George T. Washington's health and inform them of his travel plans. Includes Chambers of the Chief Justice, Supreme Court of the United States envelope with 6 cent United States stamp, postmarked August 5, 1969, Washington, D.C. Letter – 7 7/8" H x 5 7/8" W. Envelope – 4 1/8" H x 6 1/8" W. Note: George Thomas Washington (1908-1971) was an American jurist who served as judge of the U.S. Court of Appeals for the D.C. Circuit from 1949 to 1965. 8th item: TLS. One page typed letter. 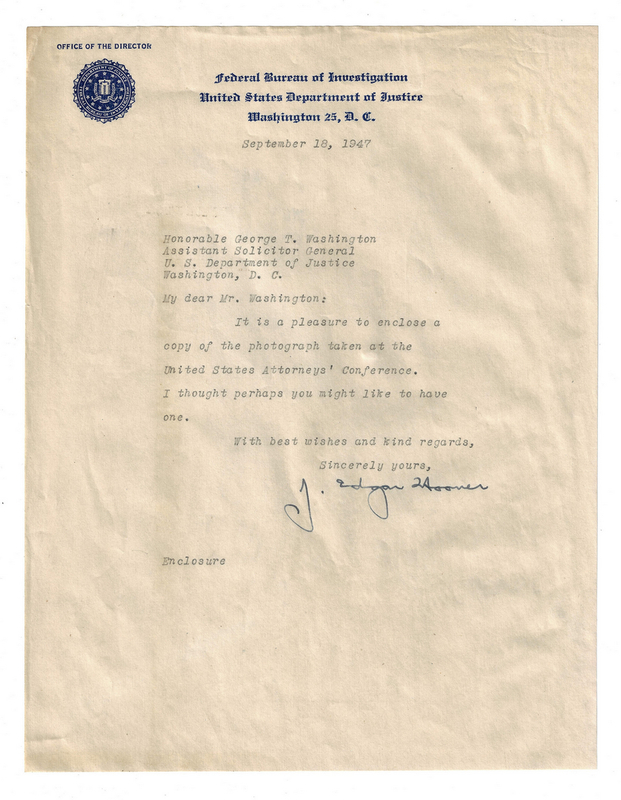 From J. Edgar Hoover, Office of the Director, Federal Bureau of Investigation, Washington, D.C., to The Honorable George T. Washington, Assistant Solicitor General, Department of Justice, Washington, D.C., dated September 18, 1947. 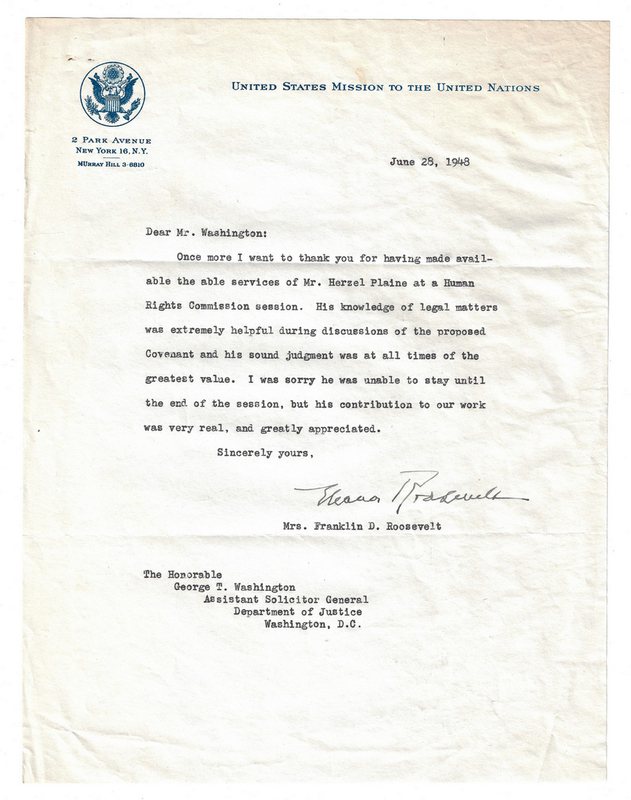 The letter reads "My dear Mr. Washington: It is a pleasure to enclose a copy of the photograph taken at the United States Attorneys' Conference. I thought perhaps you might like to have one. With best wishes and kind regards, Sincerely yours, J. Edgar Hoover". 10 5/8" H x 8 1/8" W. 9th item: TLS. One page typed letter. From Justice William O. Douglas, Supreme Court of the United States, Washington, D.C., to Professor George T. Washington, Cornell University Law School, Ithaca, NY, dated June 3, 1942. The letter reads "My dear Washington: I was delighted to receive a copy of your book, Corporate Executives' Compensation. I thank you for it and for the gracious inscription. I am glad that you carried through your early interest in the subject. The volume strikes me as being a thoughtful and careful piece of work. It should prove to be most illuminating and helpful. Your faithfully, William O. Douglass". 10 5/8" H x 8 1/8" W. 10th item: ALS. One page handwritten letter. From Justice William O. Douglas, Supreme Court of the United States, Washington, D.C., to Mrs. Helen Washington, Santa Barbara, CA, dated August 31, 1971. Douglass Douglas offers his "heartfelt sympathies" at the news of her husband's passing, referring to him as a "highly honored and respected" man. Includes Supreme Court of the United States envelope with red US Airmail stamp under a "Jobs for Veterans" stamp, postmarked September 3, 1971, Washington, D.C. Letter – 9 1/8" H x 5 7/8" W. Envelope – 3 3/4" H x 6 5/8" W. 11th item: TLS. One page typed and handwritten letter. From Ralph E. Becker, U. S. Navy Operation Deep Freeze, Washington, D.C., to The Honorable and Mrs. George T. Washington, U. S. Court of Appeals, Washington, D.C. The letter reads "George and Helen — I have flown this flag over the South Pole. Thought you would like to have it as a memento of my trip to the Antarctic, Deepfreeze Mission 64. This is an adventure and rugged Love Ralph, Ralph E. Becker". Includes small cotton U.S. flag attached to a wooden pole attached to letter and an envelope with U. S. Navy Operation Deep Freeze postmark and stamps, date covered by eight cent U.S. Airmail stamp. 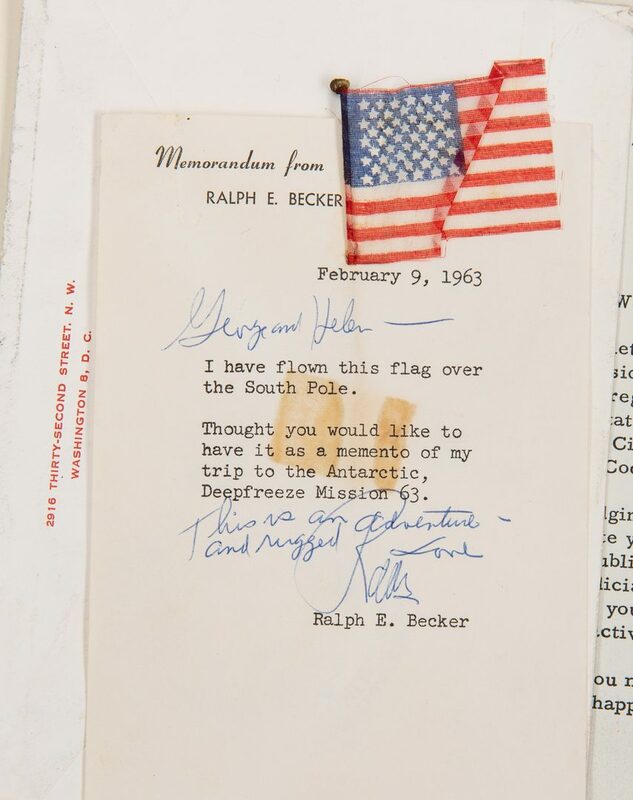 Letter – 6 1/8" H x 4 1/8" W. Flag – 3 1/2" H x 2" W. Envelope – 5 1/8" H x 7 3/8" W. Note: Ralph Elihu Becker (1907-1994) also known as Ralph E. Becker was a sponsor of the Antarctic-South Pole Operation Deep Freeze expedition, 1963; a mountain in Antarctica is named for him. 12th-17th items: Six (6) letters and carbon copies concerning Judge George T. Washington's resignation from the U.S. Court of Appeals for the D.C. Circuit. Includes two (2) carbon copies of Washington's resignation letter to President Lyndon B. Johnson, The White House, Washington, D.C., dated November 8, 1965. The two page, typed letters cite 28 U.S. Code Sec. 372(a) [Any justice or judge of the United States appointed to hold office during good behavior who becomes permanently disabled from performing his duties may retire from regular active service…] as his reason for retiring. He states that "My action has the approval of Chief Judge [David Lionel] Bazelon of this court, who will send to you his certificate of my permanent disability". Unsigned. Both letters stapled, top left corner. Includes one (1) carbon copy of Bazelon's approval of Washington's resignation. Unsigned. 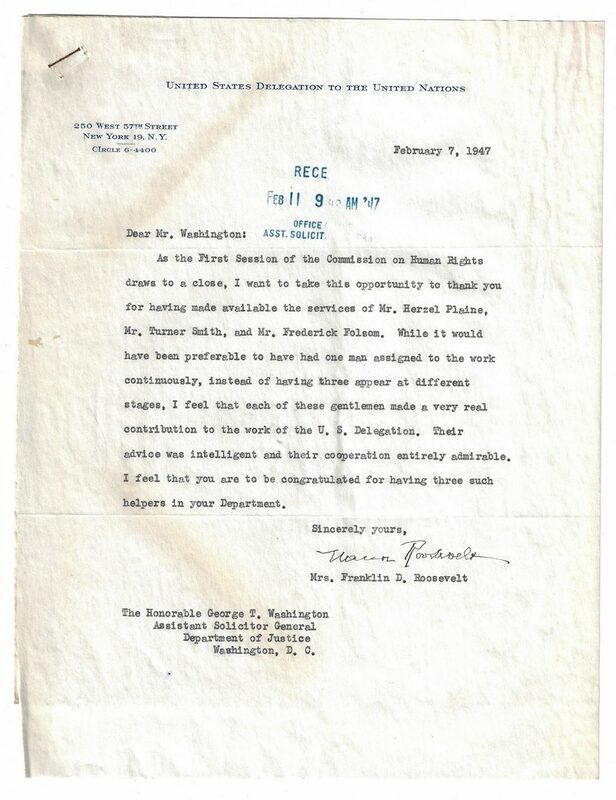 Includes two (2) carbon copies of letters to Dr. Edward S. Orgain, Duke University Hospital, Durham, NC, dated November 3, 1965, and to Dr. Worth B. Daniels, Washington, D.C., dated November 5, 1965, concerning his resignation. Includes one (1) hard copy and one (1) carbon copy of the 28 United States Code. 10 5/8" H x 8 1/8" W. Note: David Lionel Bazelon (1909-1993) was a judge on the United States Court of Appeals for the District of Columbia Circuit. 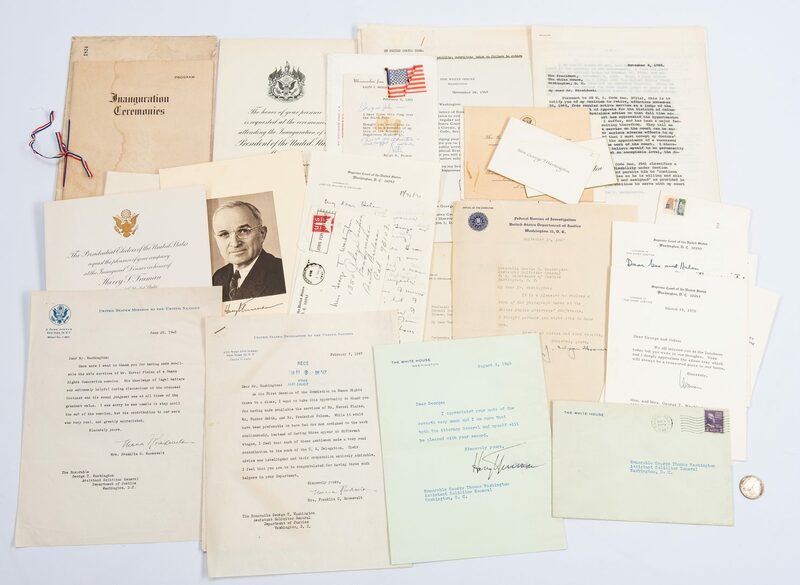 18th-19th items: One page typed letter from President Lyndon B. Johnson, The White House, Washington, D.C., to The Honorable George T. Washington, United States Court of Appeals for the D.C. Circuit, dated November 18, 1965. 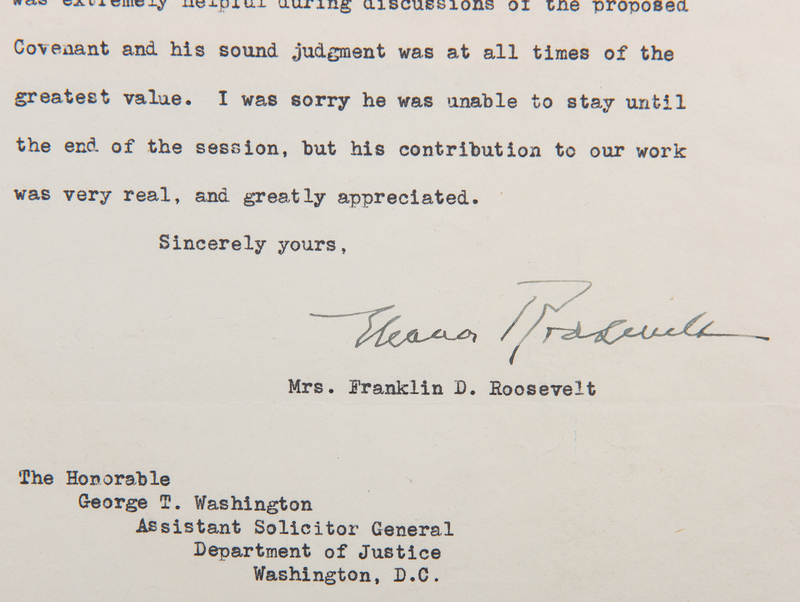 The letter acknowledges and approves Washington's decision to retire, stating "I am thankful that you will continue to serve, although with a less active schedule, as a Senior Judge". Stamped with "Lyndon B. Johnson" signature, below. Includes a photocopy of the letter. 9" H x 6 7/8" W. 20th item: Printed bifolium invitation to the second inauguration of President Woodrow Wilson on March 5, 1917. Steel plate engraving depicting the Great Seal of the United States with Columbia and four flags, above, with the names of the Chairman and the Committee on Arrangements, below. Includes engravings of Wilson and Thomas R. Marshall with facsimile signatures inside the folded invitation. Invitation – 10" H x 6 1/2" W. Engravings – 10" H x 6 3/8" W. 21st item: Program to the second inauguration of President Woodrow Wilson on March 5, 1917. 12 pages, softcover bound with a red, white and blue grosgrain ribbon. Includes United States Senate 1824 Inaugural Platform A envelope. Program – 9 1/8" H x 6 1/2" W. Envelope – 6 7/8" H x 10 3/8" W. 22nd item: Printed bifolium invitation to the inauguration ceremony of Harry S. Truman, January 20, 1949. Steel engraved Seal of the President of the United States surrounded by a laurel wreath, top center, names of the committee on arrangements, lower center. Includes lithographic portraits of Truman and Allen W. Barkley with facsimile signatures and tissue paper guards inside the folded invitation. Invitation – 10" H x 6 1/2" W. Portraits – 10" H x 6 3/8" W. 23rd item: Printed bifolium invitation to the inaugural dinner in honor of Harry S. Truman and Allen W. Barkley, Wednesday, January 19, 1949, at six-thirty o'clock, to be held at The Mayflower Hotel, Washington, D.C. Gilt embossed Seal of the President of the United States, top center, names of the committee on arrangements, lower left. 9 5/8" H x 7 1/8" W. 24th item: Printed card stock invitation from President and Mrs. Eisenhower to a white tie reception at the White House, held Thursday, February 7, 1957 at nine o'clock. Gilt embossed Seal of the President of the United States, top center. 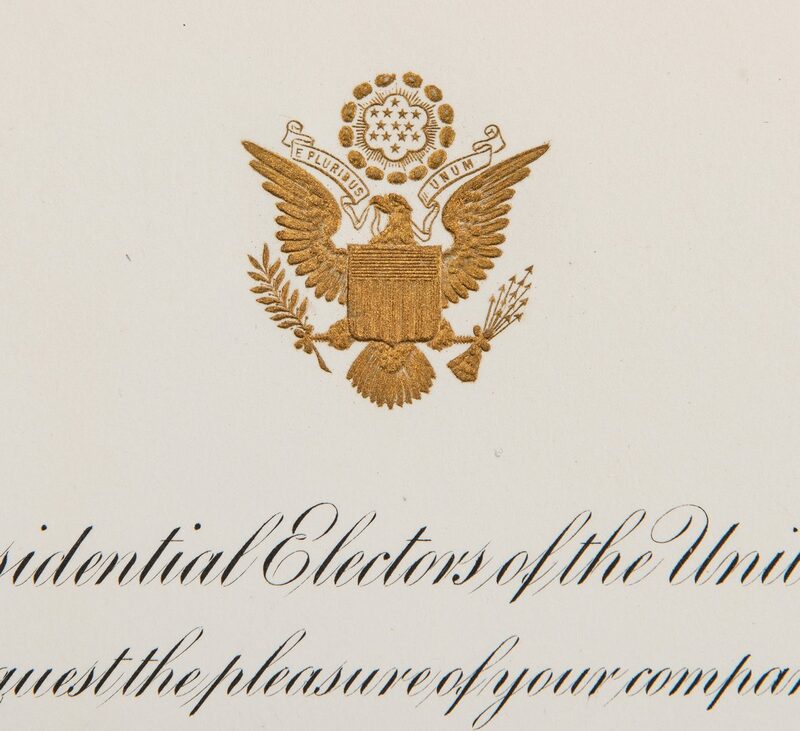 4 5/8" H x 5 3/4" W. 25th item: Printed card stock invitation from President and Mrs. Johnson to a white tie reception at the White House, held Wednesday, March 23, 1966 at seven o'clock. Gilt embossed Seal of the President of the United States, top center. 4 3/8" H x 6 1/2" W. 26th item: Printed card stock place card reading "Judge Washington". Gilt embossed Seal of the President of the United States, top center. 2 3/8" H x 4 1/4" W. 27th item: Printed paper envelope reading "Hon. George T. Washington" with gilt embossed Seal of the President of the United States, top center en verso, containing a printed card stock place card reading "Table 3". Envelope – 2 7/8" H x 4 3/8" W. Place card – 2 5/8" H x 4". All items housed in a three ring binder with plastic sleeves. Binder – 12" H x 11 1/4" W x 2 1/4" D. CONDITION: 1st item: Overall good condition. Areas of dampstaining, right side of letter, affecting majority of last name of signature. Signature in otherwise strong, visible condition. 2nd item: Overall good condition with areas of toning, surface of letter and envelope. Signature in visible condition. Rust to staple, top left corner of letter. 3rd item: Overall good condition. Signature in visible condition. 4th-7th items: Overall good condition. Signatures in visible condition. 10th item: 5/8" x 1" area of dampstaining, lower right of first page. 8th item: Overall good condition with areas of toning, largest 8 1/8" x 8 1/8", to surface of letter (does not affect signature). Signature in strong, visible condition. 9th item: Overall good condition. Areas of dampstaining, right side of letter (does not affect signature). Signature in strong, visible condition. 10th item: Overall good condition with few minute foxing spots and 2 1/8" stain, to surface of letter and envelope. Pencil inscriptions, presumably by Mrs. Washington, over Douglas' slightly illegible writing. Signature in strong, clear condition. 11th item: Overall good condition. 7/8" x 1 1/4" area of acid burn from masking tape securing flag to letter, visible surface of letter. Minute toning spots, surface of envelope. 12th-17th items: Overall good condition. Carbon copy of the 28 United States Code with ink inscriptions and corrections. 18th-19th items: Overall good condition with 1 3/8" x 1/4" rust stain from paper clip, top center of original letter. 20th item: Overall good condition. Dampstaining, right side of Marshall engraving. 21st item: Overall good condition. Dampstaining, extending from right to center left of covers and pages and envelope. 22nd item: Overall good condition. 23rd-27th items: Overall good condition. Areas of dampstaining, water rings, surface of some invitations and envelope.